Serving the Syracuse and Central New York area since 2001, we offer the highest quality, precision wheel and rim powder coating for cars and trucks, and commercial fleets, as well as motorcycle, ATV, metal furniture and equipment. With our overhead conveyor line and batch ovens we are able to handle small to medium sized production runs. Located in North Syracuse, just off Molloy Road, Rick’s Wheels has been serving customers who are looking for a consistently high quality finish combined with a service philosophy that is attuned to their specific needs, deadlines and schedules. We are a Syracuse-based powder coating company known and trusted for the quality of our work, the in-depth understanding of our customers needs, the solid value we deliver, and our second-to-none customer service. 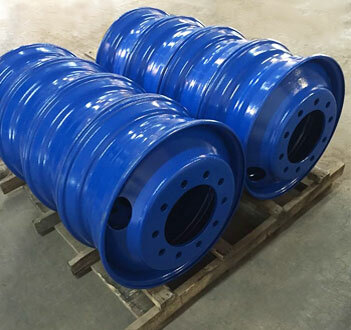 We are a process based Syracuse Powder Coating company delivering consistently high quality powder coating application services with quick turnaround to the transportation industry, as well as individuals, companies, and fleet owners who place a premium on a high quality, durable, lasting finish at value based prices. From OTR truck and rim work, to antique automobile wheels, sports cars, patio furniture, fences, custom choppers and more, we’ve been tested and proven by our customers for over 16 years.